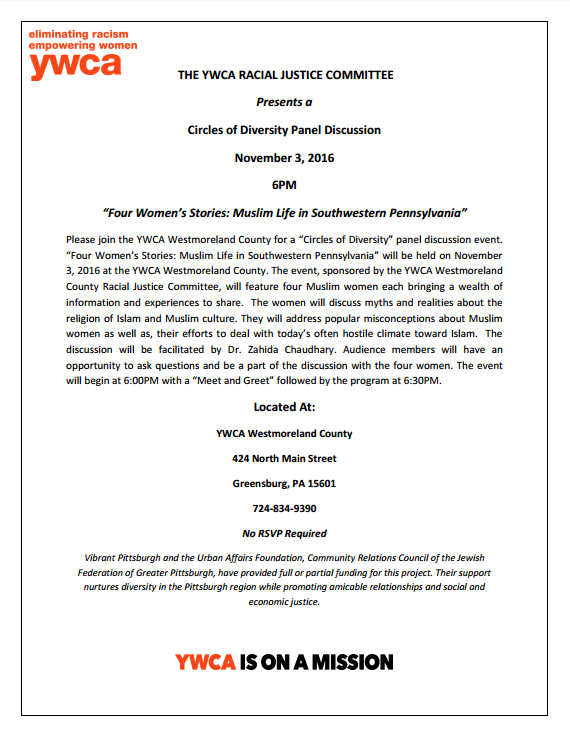 Please join the YWCA Westmoreland County for a “Circles of Diversity” panel discussion event. “Four Women’s Stories: Muslim Life in Southwestern Pennsylvania” will be held on November 3, 2016 at the YWCA Westmoreland County. The event, sponsored by the YWCA Westmoreland County Racial Justice Committee, will feature four Muslim women each bringing a wealth of information and experiences to share. The women will discuss myths and realities about the religion of Islam and Muslim culture. They will address popular misconceptions about Muslim women as well as, their efforts to deal with today’s often hostile climate toward Islam. The discussion will be facilitated by Dr. Zahida Chaudhary. Audience members will have an opportunity to ask questions and be a part of the discussion with the four women. The event will begin at 6:00PM with a “Meet and Greet” followed by the program at 6:30PM.